S’mores cupcakes? Put a little teddy in it | write meg! While I’ve stalled out a bit on my whole “learning to cook” plans, I definitely have not given up on the baking side of things. Riding high off the success of our macaroons, I sauntered back into the kitchen to try my hand at s’mores cupcakes last weekend. Now, I’ve made an incarnation of these before — from a recipe I found on Bakerella’s (love her!) site. Y’all remember those? They were quite tasty and very, very chocolatey. It was probably all that cocoa powder I had to add. And hey, who am I to disappoint the kids, you know? 1. Heat oven to 350°F (325°F for dark or nonstick pan). Place paper baking cup in each of 24 regular-size muffin cups. In large bowl, beat cake mix, water, oil and eggs with electric mixer on low speed 30 seconds. Beat on medium speed 2 minutes, scraping bowl occasionally. Fold in graham cracker crumbs and chopped chocolate bars. Divide batter evenly among muffin cups. 3. Remove and discard lid and foil seal from jar of marshmallow creme. To soften marshmallow creme for easy removal from jar, microwave on High 15 to 20 seconds. In large bowl, beat marshmallow creme, butter and powdered sugar on low speed until blended. Beat in enough milk, 1/2 teaspoon at a time, to make frosting spreadable. 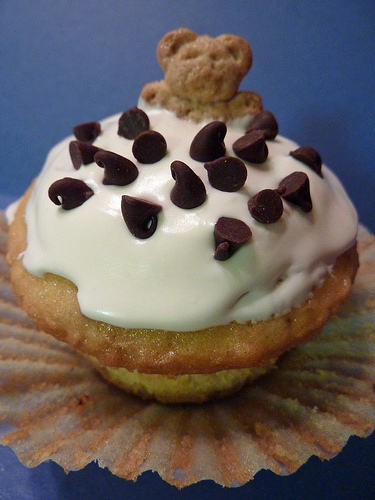 Spread over tops of cupcakes. Divide chocolate bar into rectangles. Cut each rectangle diagonally in half and place on top of each cupcake. 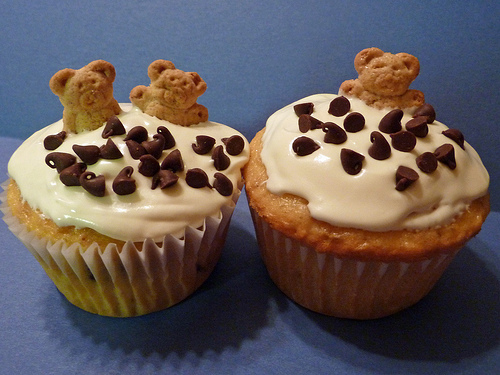 Top each cupcake with bear-shaped cracker. After frosting has set, store loosely covered at room temperature. What a cute idea, those teddies! 4 bars of chocolate and another one on top? Sounds great! I think I may be drooling just looking at the cupcakes. I’m going to try out this recipe some time next week. Hopefully I won’t burn down the house in my attempt to make it. Ohhh yes! Will be trying these the next time the baking bug bites. OH! These are adorable. I will definitely be making these this summer! Thanks for sharing! I think I’ll have to try these for the next office party. Um, those cookie monster cupcakes are awesome. And adorable! O my gosh those look delicious. I better go each dinner before I try and make and eat something like this. My sibs and I went wow with these! Especially for the teddy bears. Poor them though, they’ll be eaten by Meg! Those look absolutely delicious! And thank you for the link to Bakerella, I’m already drooling on my keyboard.